In this Internet-savvy world, people need effective and efficient answers to their queries. This is the reason for many online bookmark management services to be launched since decades. Social bookmarking sites allow people to share web pages, links with their network. Websites calculate their success on the basis of the unique visits they receive and the traffic their websites attract. With higher number of people visiting the site, its ranking in the search engine goes high. 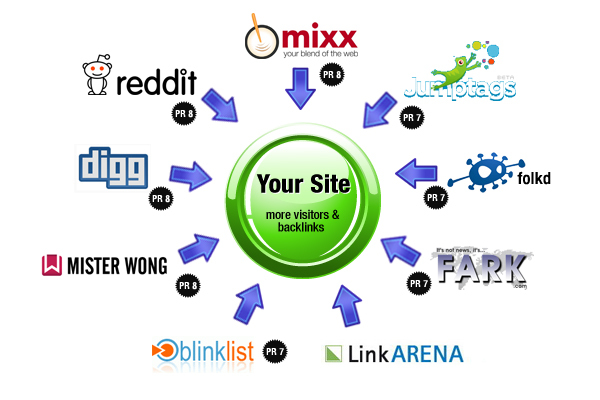 So let us see how to augment traffic through some popular social bookmarking sites. Social bookmarking sites are extraordinarily popular these days. If an individual includes a link to your website's page in his list, his network is likely to follow this link too, thereby increasing traffic to your site. There are times when excellent content may be neglected by the visitors just because it does not have an attention grabbing headline, which is the first thing that a visitor looks at. Headline is supposed to trigger a pre-judged opinion about the contents. More attractive and catchy a headline is, more the chances are of its content being read. Just as a headline is important, a provocative description is vital to augment the website traffic. However, while giving an alluring description, remember it should not include any false statements. Another important thing to remember is that a description has to be precise up to 150-160 characters, with spaces. An opening paragraph is crucial to hold attention of any visitor to a site, especially for social bookmarking sites. A keen visitor who has liked the headline of your page, and is provoked by your description to read further should not be dissatisfied by the opening paragraph. Great headline and alluring description both cannot replace the value of great content. Visitor will come back to your website, if he finds your article informative, easy to understand, and unique. If you want your visitor to bookmark your website's pages, you must provide a bookmark button at the end of the article, so as to make it easy for others to vote and bookmark your site. Not only should you use your websites in your bookmarks, but you can add any other relevant pages to keep people from resenting about your self-praise. It is vital that you pay attention to the submission time. Some bookmarking sites allow some stipulated time to get to the front page. Thus, if you are submitting your articles while your supporters and other potential visitors are sleeping, you might lose the opportunity to reach to the front page. Also, submission on weekdays may face a lot of competition that pages submitted on weekends. There are chances that the bookmarking site does not have any appropriate category for you to submit the article then you must submit it in the closest suitable category. However, in other cases select the appropriate category. If it is not relevant to the category they are surfing, it is less likely that visitors will bookmark your site or share it. Social bookmarking sites are the latest promotional aspect that several website owners are exploiting to enhance the website popularity and increase the traffic. The whole idea of social bookmarking sites is to be able to share something unique and interesting found while surfing the internet. So how to ensure that you appear on the front pages of some of the popular social bookmarking sites? Above given are a few effective tips to do this effectively.